Once again, I’m going to have to preface a review of a comic by humbly apologising to its creator. In spite of my glowing praise for Leftovers: Book Four and my assurances that – given how goddamn awesome it was – I’d make sure I wouldn’t neglect the next instalment, that’s exactly what I ended up doing. I suppose the irony of a book called ‘Leftovers’ being once again overlooked and ‘left over’ in terms of my reading pile is potentially amusing, but when the quality of a book is so incredibly high, it really deserves to be treated with a higher level of priority. So, yeah… sorry Jason. Again. Okay, grovelling apologies aside, let’s talk about the comic itself. 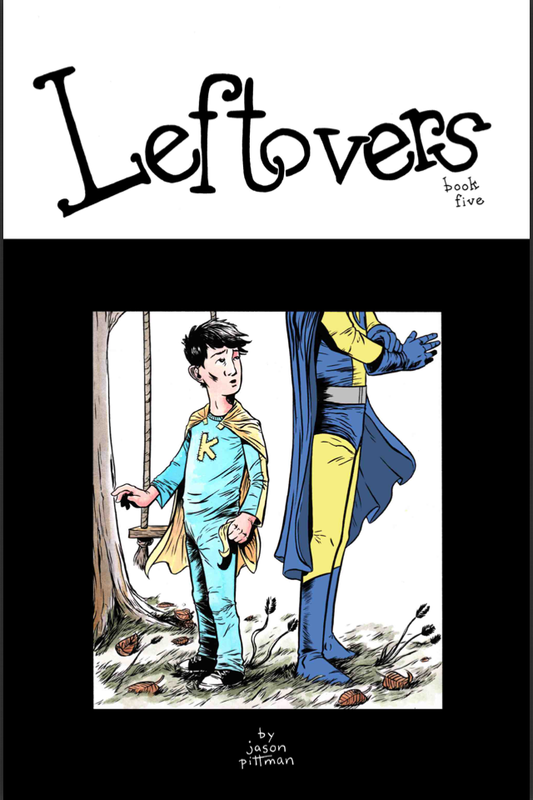 Leftovers Book Four introduced us to Kaleb, a young man dealing with crippling social anxiety issues which have a tendency to manifest themselves in the form of a caped hero – and villain – watching over him and playing out his internal struggles in a violent, visual manner. In my review of the previous issue, I gushed over the inventive use of this particular storytelling device, and of its use to perfectly display the Kaleb’s ever-present anxiety, bubbling just beneath the surface in a medication-induced slumber. In this issue, we delve a little deeper into Kaleb’s past and discover just how he came to have these costumed characters watching over him in the first place. We flash back to his childhood where, rather tellingly, everything is in full colour as opposed to the bleak, black and white world of his present day. We see the creation of these ‘imaginary friends’ by a young boy with a deep love of superheroes, and fondly recall the detail of their early adventures. However, when his fellow schoolchildren start cruelly mocking the superhero customer his mother makes for him – in what may incidentally be one of the most moving pages in any small press comic I’ve ever read – Kaleb finds himself forced to let them go, and slowly, painfully, the colour and self-confidence is drained out of his life. I’m not going to talk too much about the specific events of this book, as I feel it would diminish the impact of reading them for yourself – which I highly recommend, by the way – but the bulk of the issue deals with Kaleb’s struggles in the present day to cope with his anxiety following the brave (or potentially foolish) decision to stop taking his medication, and features some movingly believable exchanges between Kaleb and his girlfriend Addey. Once again, the battle between the different sides of his illness are manifested visually as the hero and villain do battle in the background, and once again the device is utilised to scintillating effect by Pittman to add further emphasis to the ongoing narrative. Alongside the masterful storytelling, credit must also be given to Pittman for the artwork, which perfectly manages to convey the emotion and frustration of Kaleb as he struggles to keep himself in balance. Neat little visual touches abound, such as the sad wave goodbye from the ‘hero’ as the younger Kaleb runs away from him, to the menacing ‘villain’ lurking on the periphery as Kaleb is forced to try and overcome his anxiety by entering a crowded bar. Granted, there may be the occasional ‘wonky’ expression, and awkwardly posed torso, but for the most part, the sheer expressiveness of his characters more than outweighs any minor niggles in terms of form or detail. Also, the colour work – as I mentioned previously – is used spectacularly to illustrate the change in Kaleb’s outlook on life, as well as to highlight his ‘costumed’ inner struggle. Leftovers is not a superhero story folks, nor is it a particularly far-fetched tale. Instead, what we have here is a deeply intimate look at a young man struggling to overcome his crippling anxiety, and finding himself pulled in two opposite directions by his own subconscious notions of ‘right’ and ‘wrong’. Absolutely essential reading for any fans of sequential storytelling – or of compelling, inventive fiction in general. Leftovers Book Four can be purchased online at indyplanet.com or http://leftoverscomic.storenvy.com. You can find out more about the series at the Leftovers Comic Facebook Page, and check out creator Jason Pittman’s DeviantArt page.